This love story of the aged is a love story for the ages. 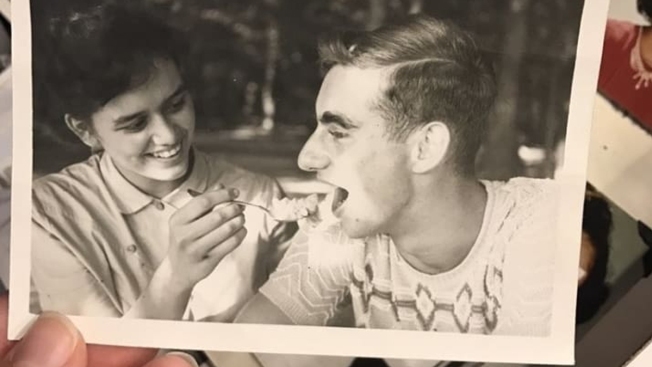 Joyce Kevorkian and Jim Bowman, both 81, were high school sweethearts and prom dates from Illinois, but life took them down different paths. They went to different colleges, married different people and had their own families. But now, 64 years later, the two are married, and it’s almost like nothing has changed. "The whole thing happened very quickly," Kevorkian's granddaughter, Anna Harris, 21, told NBC. Harris said that around the holiday season, Bowman sent Kevorkian a letter asking how she'd been and seeing if they could reconnect. She said her grandmother was really excited and responded right away. Kevorkian told NBC that the two had good times together when they were younger, and that she thought it would be nice for the pair to see each other again. They talked on the phone constantly, Harris said, until Bowman finally decided to make the drive from where he lived in Springfield, Illinois, to where Kevorkian resided in South Bend, Indiana. Harris said her grandmother was initially worried about how the visit would go, but "it was like no time had passed and they reconnected immediately." "It has been fun," Kevorkian added. Kevorkian told her granddaughter that she felt like she was 17 years old again--and Harris couldn't agree more. "She acts a little like a little kid, or a high schooler, who's fallen in love for the first time,” Harris said. "It's really sweet." Harris said that Bowman stepping into her family's life was a good thing. After her grandfather died, she said, her grandmother wasn't really herself anymore. But Bowman, who also lost his spouse, changed that. "It was like a part of her died also," Harris said. "And once Jim came into the picture, she began having a more positive outlook." Kevorkian said her granddaughter has told her she's more cheerful than she used to be, too. Bowman’s proposal came around Christmas time, and Harris was in the room for it. However, it wasn’t exactly traditional, as he did it through the phone. "She looks over at me and goes 'Well huh, that was a really strange phone call. Jim asked me to marry him," she said. "Well I said, 'that sounds like a good idea!'" according to Harris. Harris was charged with keeping the proposal a secret until her grandmother could announce it to her family on Christmas Eve. Initially, Harris said, her family was a little unsure of the situation, as they’d never met Bowman before. "It didn't take long for everyone to warm up," she said. Harris added, "It's pretty easy to see when they're together that they want to be around each other...they're clearly in love." "I think our children just wanted us to be happy in our old age," Kevorkian said. She added, "We wanted to be together...we picked up where we left off." The couple still has the same jokes, she said, and they also still have a love for dancing. The pair also reconnected with old friends from high school, who Kevorkian said were surprised to hear that the two were getting married. The wedding was held on April 1 at the retirement community where Kevorkian lives in Indiana. Harris said it was a small wedding, but "really sweet." "I think everyone's just so happy to see my grandma happy again," she said. Kevorkian described the wedding as "perfect." Bowman's daughter Julie even reached out to Kevorkian in a letter that said, "Thanks for helping my dad smile again." Harris said when she posted photos of the wedding online, she half hoped it would spread. And now that it has, her grandmother is excited. "Obviously they're happy," Harris said. "But it's a whole different level for her and Jim to see that their story is touching so many people." Kevorkian added that she was surprised by the attention her story has garnered. She thought, "Why should anybody be so entranced with such a simple story?" Harris said she's been asked a lot about whether Kevorkian is related to the famous Dr. Jack Kevorkian. She's not. She's also been asked about what it's like having Bowman in her family now. She said she's thrilled to have him in her life, and said that while some people think it’s strange for grandparents to get remarried, Bowman isn’t replacing her grandpa. "Instead, he just gave my grandma back," she said.